What a finale to the season at the Bergsee Ratscher! 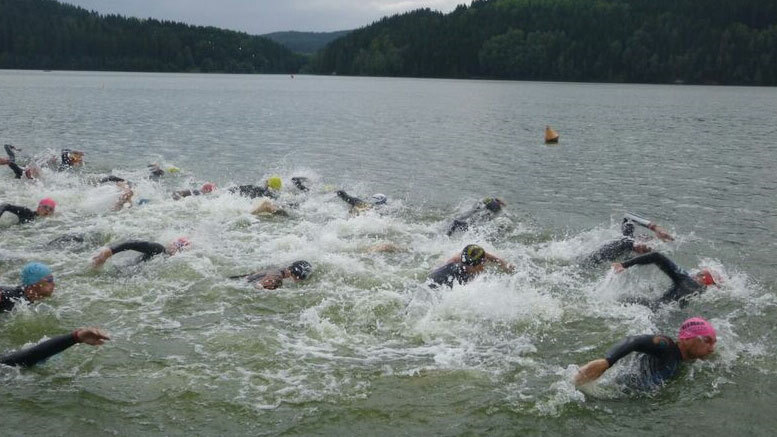 This long standing Quadrathlon, which has been hosted by the Triathlon Club Suhl since 2003, had a lot to offer this year. 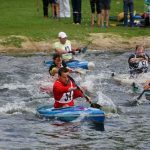 On the one hand, the title of the European Sprint Championship was to be awarded last weekend, on the other hand it was also the last race in the WQF World Cup and the QUAD Germany Cup – as a consequence, many strong athletes were on the start and spectators were not disappointed. At around 17 degrees the swimming (750m) in the mountain lake was quite fresh compared to the less than welcome ambient conditions of cloud and 15 degrees. As expected, Lisa Teichert (GER) was the first woman into transition, from where she went on to extend her lead and fished 12th Overall behind the some of the strong Male contingent. The defending European champion therefore retained her title. 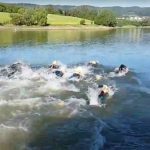 Behind Teichert, Anna-Lena Klee (GER), Laura Jansen (GER), Helen Dyke (GBR) and Magdalena Koberová (CZE) were in pursuit on the cycle ride through the hilly foothills of the Thuringian Forest. Jansen then Klee then Dyke was the order after the two laps of cycling on a wide track with a good surface. Koberová unfortunately suffered some mechanical problems and lost a lot of time and some places. Back on the mountain lake, four laps of kayaking were on the agenda. Here Jansen showed what she had learned from her coach Lisa Teichert and consolidated her second position. She continued with a strong performance on the run to be awarded second place in the European Championship. After the kayak Helen Dyke lay in third, which she held on to. She was also the last of all athletes, who was allowed to start the 5km run. What happened? Unfortunately, the weather worsened during the race. After the rain, the lightning began. At this point some athletes were still kayaking on the water. The organisers had no choice but to curtail the race for these and to get them off the water as quickly as possible. Safety should always be paramount! Naturally this was not what anyone would have hoped for, everyone in a competition wants to finish. 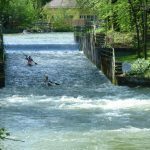 To reach a final ranking of all the racers the following solution was decided upon: All those who were not allowed to finish the paddle were given their positions that they held after the cycle and thus they could receive corresponding points in the cup rankings. This solution is not ideal but was the fairest that could be found in this exceptional situation. In the men’s race some athletes in the middle and rear of the field were also affected by the thunderstorm and even though the top racers were able to complete the event there were some unexpected results amongst them. In the swim Tomáš Svoboda (CZE) was once again in front. He had the advantage of a 1minute 30 sec lead over the three-man following group of Jonathan Monteagudo, Enrique Peces (both ESP) and Stefan Teichert (GER). 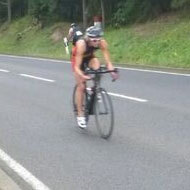 On the bike, the Czech was also the fastest and increased his lead to 2 minutes at the beginning of the paddle. 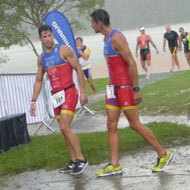 Behind Svoboda – being encouraged by his twin brother David (Olympic Champion 2012 in modern pentathlon) – the two Spaniards followed by Teichert set off. On the Germans heels was fellow German Thoralf Berg and Fernec Cisma (HUN). These six were the first to finish the bike course. But suddenly, Enrique Peces was a few places further back. The Spaniard had discarded a gel wrapper, which was forbidden by the organiser. In order to avoid the threat of disqualification, he went back onto the bike route to retrieve his litter. This lost valuable, race-deciding minutes. While paddling, one could see the improvement of Svoboda, but against the strongest paddlers he still loses time. 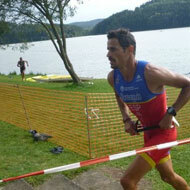 Monteagudo was the first to set off running with a few seconds advantage and Ferenc Cisma was only 40 seconds behind. The Hungarian, however, could not hold onto his third place. Behind him, Thoralf Berg, who picked up the pace on the run, overtook to secure his second podium position this year in a Championship race. At the front, there was a duel between Svoboda and Monteagudo; even though the Spaniard tried everything, in the end the Czech was too strong for him. 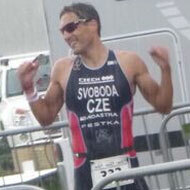 This win also secured the World Cup overall title for Svoboda alongside this European Championship. 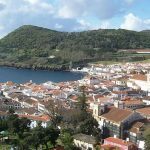 Next year the Triathlon, which is also held there, is celebrating its 30th anniversary. 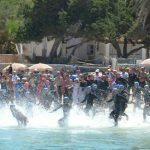 Depending on the outcome of the upcoming WQF Congress, Ratscher will probably host the 2018 Quadrathlon Sprint World Championship. The organisers, Sebastian Diez and his team have already ordered good weather. In the next few days Quadrathlon4YOU will review the 2017 World Cup and the German Cup. 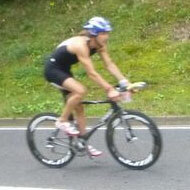 Not all the positions were finalised until this last race of the season at Bergsee. 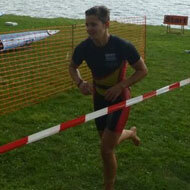 Be the first to comment on "European Sprint Championship: All Unclear until the Finish"